This project was a fantastic way to enhance something that was already a part of our school calendar, the KS3 Sports Days, and to raise the profile of our international links and provide a mechanism for them to impact on all students in the school, not simply those who take part in the exchanges, trips or other project work. It was also a very concrete and innovative way for two of the school’s specialisms to work together and join up two significant aspects of the school’s ethos: sport and languages. 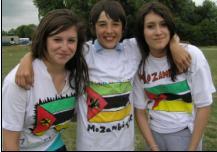 Students adopted countries as their own in the build up to and during the sports days themselves. The countries selected for representation are the school’s current international links through residential trips, exchange and sponsorship programmes. Students had, by the time of the event in early July, designed country specific t-shirts in Art, researched the country and produced a presentation on it in language and ICT lessons, designed specific, statistical spreadsheets in maths and developed an understanding of key aspects of the countries’ geography. This work was then extended to tutor time where staff were equipped with resources to further develop the students’ understanding of their ‘adopted’ country. This enthusiasm was channelled into competitions for country-themed notice boards for each tutor group, which were judged by the Director of Specialisms of Languages and Sport. Providing resources for tutor time was an aspect of the project that served to enhance the theme of teamwork upon which our Sports Days are based. On the Sports Days themselves, the students compete in their tutor group teams, with points for participation in all of the different events as well as for winning. The resources that were developed for tutor time included a cultural multiple choice quiz, some essential phrases in the language or languages of the country (with audio! ), information about an interesting cultural element, the national anthem of the country and even some supporters’ chants in the language. The countries involed are: Peru; Spain; France; Germany; Holland; China; Mozambique; South Africa, Norway, the Slovak Republic and Italy. All of these materials are available for download by countries. The overview slide lists the resources available for each country. Please note that the videos for the chants and anthems are all available from YouTube - links provided on the relevant slides.